This week’s high-yield ABIM Exam Prep post discusses the workup of Cushing’s. At initial glance, it can seem complicated but following a systematic approach makes the diagnosis very simple. Cushing’s is a condition that is due to excessive cortisol production. The initial diagnostic test is to check a 24 hour urine cortisol. If the 24-hour urine cortisol is greater than 100mg/dl, then we can assume that the patient has Cushing’s. If the 24-hour urine cortisol is low to normal, then Cushing’s is essentially ruled out. 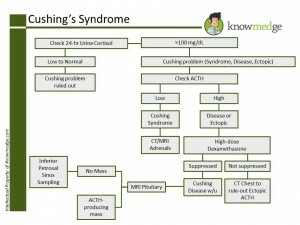 Cushing’s is divided into Cushing’s disease, Cushing’s syndrome, and ectopic production of ACTH that leads to Cushing’s. After a 24 hour urine cortisol confirms that a patient has Cushing’s, the next step is to check an ACTH level. If a patient has a suppressed (low) ACTH level, the problem lies in the adrenal gland. This likely indicates that an individual has Cushing’s syndrome. CT or MRI of the adrenal gland should be done to look for a mass in the adrenal gland. However, if the ACTH level is high, the problem lies in either the anterior pituitary (Cushing’s Disease) or is due to ectopic production of ACTH, usually because of small cell carcinoma of the lung. To distinguish between the two conditions, a high dose dexamethasone suppression test is performed. This is performed by giving the patient 8mg of dexamethasone and seeing what happens to the cortisol level. If cortisol gets suppressed with high dose dexamethasone, the patient likely has Cushing’s disease. If the cortisol fails to suppress with high dose dexamethasone, the patient has ectopic production of ACTH that is causing the Cushing like features. If you are now concerned about Cushing’s disease (because high dose dexamethasone suppressed cortisol and ACTH level is high), an MRI of the pituitary is performed to look for a pituitary lesion. However, if the lesion is not present and your suspicion is still high for Cushing’s Disease, then inferior petrosal sinus sampling is done to confirm the diagnosis. With ectopic production of ACTH (high ACTH levels and no suppression of cortisol with high dose dexamethasone), a CT scan of the chest is done to look for a lung mass that could be causing ectopic production of ACTH. 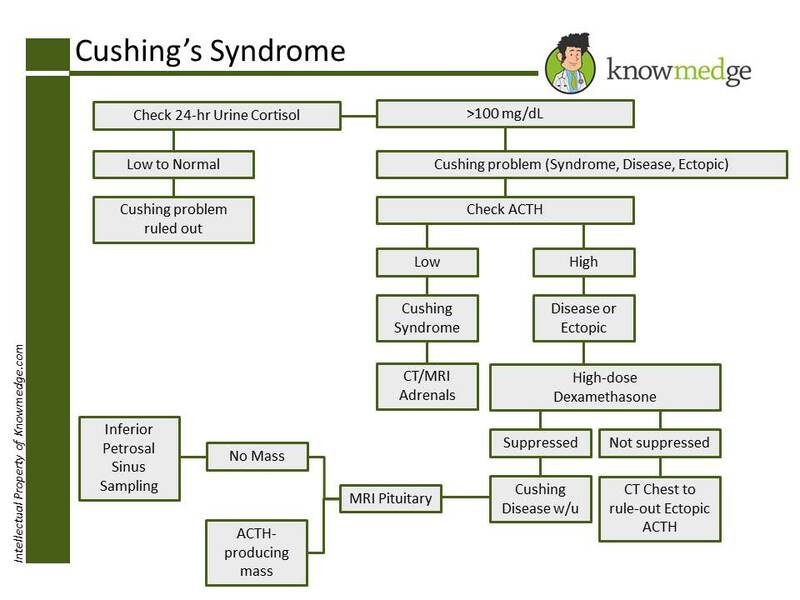 Hopefully with this explanation and the above diagram from the Knowmedge ABIM QVault, you will be able to master the workup of Cushing’s, a topic that is mentioned on the ABIM examination learning objectives under the adrenal disorders portion of the endocrinology medical-content category.